Know any Harley fans that work for the government in public service positions? This might just make a great gift. And if you're a public officer yourself, chances are you already have a great blade to use. But if not, read on. This might just be what you're looking for. 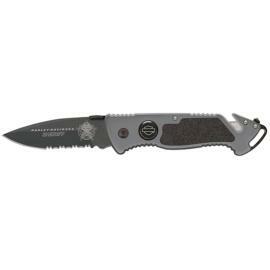 This Harley-Davidson folding knife is specifically crafted for search-and-rescue units. It features a seat belt cutter, a carbide glass breaker, as well as a heavy-duty lanyard. Try finding all those on other knives. The monochrome styling is understated but classy and prominently features the Harley branding, both when opened and closed. Its partially serrated blade is made from 440 stainless steel, with its handle made from lightweight 6061-T6 aircraft aluminum. The blade itself measures over 3 inches, and the entire knife measures just short of 5 inches when closed. Some intelligent thought went into making the handle as well, since the manufacturers realized most users would be wearing thick work gloves. The handle features a large thumb stud and an easy blade release just for that reason. This really is a tough folding knife, designed to hold up in intense situations. It's a Harley knife, so what more did you expect?